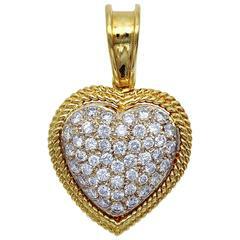 Very fashionnable, modern looking pendant necklace. A nice chubby cabochon garnet in it center, while four princess cut garnets makes the branches of the cross. Hammered gold (18kt) pendant set with green tourmalines and citrines and a pearl in its middle . The hoop can be opened and closed to allow il to be hung on different size chains. 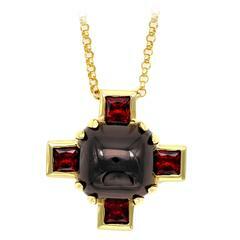 Hand made very large, 18K faceted lapis and ruby cross pendant. Excellent condition, made in the 1970s. A pretty necklace with beautiful scalloped edges, set with a central oval shape fresh water pearl. The diamonds in the surround total 0.46cts. The chain measures 16 inches length.